With over 100 years of coal fired brick-oven pizza-making traditions, we continue to ensure that future generations are able to experience our distinctive and truly authentic pizza. Why coal-fired brick ovens? The tantalizing aroma of pizza and calzones baked to perfection in our signature coal burning oven offers a unique flavor and a crisp crust that is just not possible from gas, convection, or wood burning ovens. Our fresh ingredients, handmade mozzarella, ‘secret recipe’ dough and pizza sauce make us the most award-winning pizzeria in the United States. 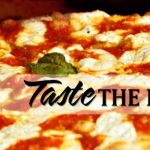 It is our passion for pizza that has made us a “must have” for pizza lovers and celebrities alike, including Frank Sinatra and former NYC Mayor, Rudy Giuliani. Welcome to Grimaldi’s Pizzeria, we are honored to have you as our guest!